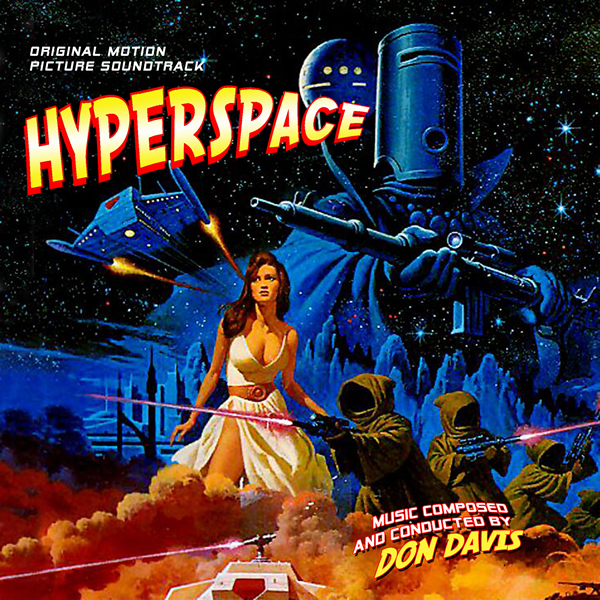 Dragon’s Domain Records, distributed through buysoundtrax.com, presents the long out-of-print orchestral score to HYPERSPACE, composed by Don Davis. 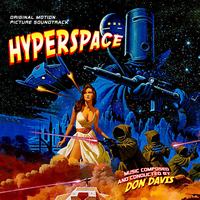 One of the first feature length STAR WARS parodies, HYPERSPACE came out in 1984. Known in England as GREMLOIDS and as GREMLORDS in France and Germany, HYPERSPACE was writer/director Todd Durham’s second and last film as director, working with ambitiously cost-conscious low-budget producer Earl Owensby. The movie was released in September 1984, but it wasn’t until 1988 that the film received a wider release on home video. Starring comedians Chris Elliott and Paula Poundstone and filmed in North Carolina, HYPERSPACE imitates STAR WARS in context and execution from its opening text crawl into infinity to its inscrutable helmeted monarch of menace, Lord Buckethead (played by Robert Bloodworth, but voiced by Barry Cooper). Lord Buckethead is hot on the trail of vital radio transmissions stolen from the corrupt Galactic Alliance by members of an allied resistance force. Buckethead intends to get them back, aided by diminutive, Jawa-robed minions known as gremloids. However, unbeknownst to him, he has made a serious navigational error, and rather than reaching his intended destination he lands instead upon the Earth, where he and his gremloid faction march into the closest small town and proceed with their mission. A purposefully STAR WARS-esque orchestral score was provided by newly-minted composer Don Davis, in his first feature film score. Performed by a live, 56-piece orchestra, Davis’s music provided the film with its missing gravitas; and it made enough of an impression among Hollywood film music folk that it led to a lasting and respectful career scoring films and television, including TV’s BEAUTY AND THE BEAST and SEAQUEST DSV and blockbuster films like THE MATRIX series and JURASSIC PARK III. “Obviously the movie was a parody of STAR WARS, so the only approach to music I could logically take was similarly a parody of John Williams’s work,” said Davis in an exclusive new interview for the album notes. “I got as close to STAR WARS as I could get without it being STAR WARS.” Davis provided the right kind of feeling to the music which gave the score a suitably grandiose dynamic and aided in the film’s parodist nature. The film came and went without much ado or remembrance, but the music was noticed and that gave Davis an auspicious debut in this, his first opportunity to make the jump into… HYPERSPACE. The score was first released on an 11-track CD in 1993, paired with another Davis score. This expanded reissue from Dragon’s Domain Records includes eight previously-unreleased tracks. HYPERSPACE is a limited edition release of 1000 units and can be ordered at www.buysoundtrax.com. The first 50 units sold through the Buy Soundtrax website will include a booklet autographed by the composer. Ships the week of January 3rd.